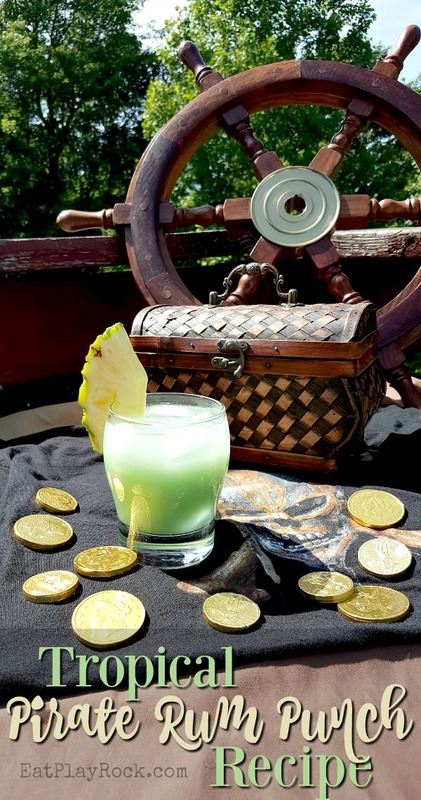 With the right rum punch recipe, you can throw the perfect Pirate Party. 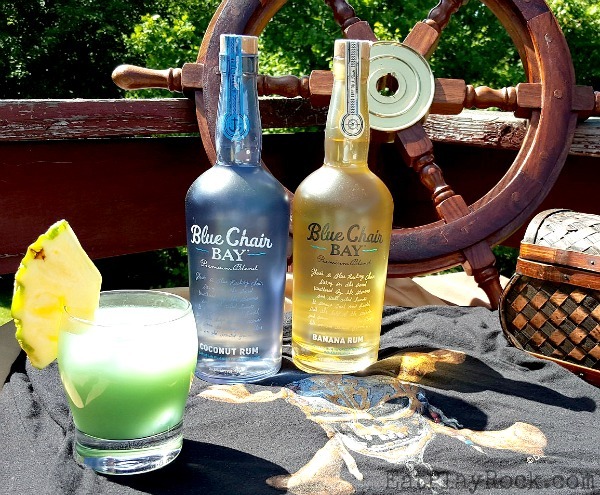 So, I have partnered with Blue Chair Bay Rum to help you do just that. Mix up some of this Easy Tropical Pirate Rum Punch, throw on some Kenny Chesney tunes, and get the Pirates Of The Caribbean celebration going! As always, drink responsibly, 21+ only, please. I like to use a 12-16 ounce glass for this recipe. First, add 4-5 ice cubes to the glass. 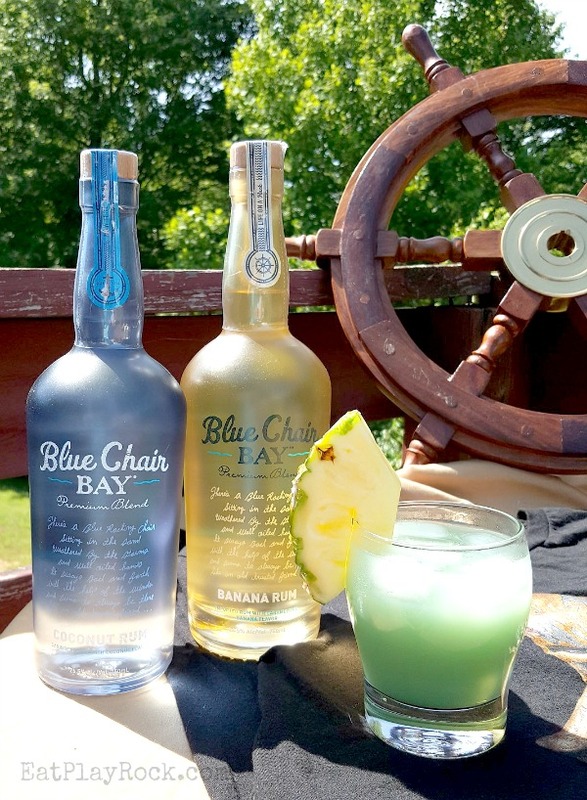 Next, add both the Blue Chair Bay Coconut Rum and the Blue Chair Bay Banana Rum. Then I add the Blue Curacao and fill the rest of the glass with the Pineapple Coconut juice. Then stir, add a piece of pineapple to the side of your glass and enjoy. If you are feeling really festive, you can even add coconut shavings to the top. It might even be fun to try this as a frozen concoction. I have not done that as I like my drinks simple, but if you do, please be sure to let me know how it turns out in the comments below! I bet you guys are loving my doubloons, eh? I actually got those at the Pirates Of The Caribbean: Dead Men Tell No Tales premiere party! I know that, unfortunately, not everyone got to go, but that doesn’t mean you should have to do without doubloons of your own, right? So make your own! Amanda from Survival Guide by the Working Mom has a very cool “recipe” so that you can make your own edible gold coins here. No party is perfect without the right tunes. Am I right? So, we here are our suggestions for the perfect Kenny Chesney tunes for a Pirate Rum Party! 2. Pirate Flag – “A pirate flag and an island girl.” Naturally. 4. Summertime – “Cheap shades and a tattoo and a YOOHOO…” Tell me you didn’t sing along. And Be Sure To Watch Pirates Of The Caribbean: Dead Men Tell No Tales – Now In Theaters Everywhere! This rum punch recipe looks so good I would love to mix one right now. I will have to save this recipe. My cousins are visiting next weekend and this would be a nice drink to serve. The color looks too refreshing for the eyes. It’s a great drink to cool off on a hot summer day. That sounds really tasty. 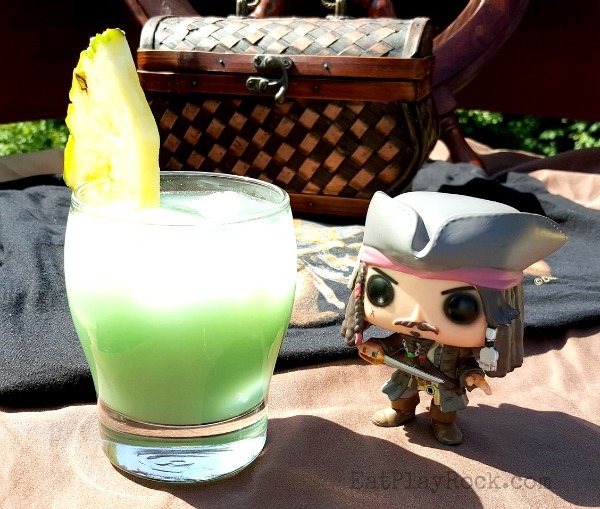 My husband and I would really enjoy this awesome Pirate Rum Punch. Why is the rum always gone? Oh wait! It’s because it’s in drinks like these. Oh I love run drinks they are so refreshing! These look amazing, great for the summer would love to try these for sure! I think this is the perfect treat for Memorial Day. I am always looking for a tasty drink that has a tropical punch to it. I definitely will be trying this one! We love Pirates of the Caribbean! Can’t wait to see the new one. And wow! The pirates punch looks fantastic! Now this looks amazing! I saw your pictures on Facebook yesterday and thought about how great it looked! Today we are making them! Now this sounds like the most perfect recipe for a rum punch, when I hold a garden party this summer I am totally going to have to try this recipe out. Now this is a clever pirate themed idea. It’s going to be perfect for a super hot day! I need to make more drinks like these! Oohh, I love the color of that drink! I’m sure it’s refreshing in the summer. 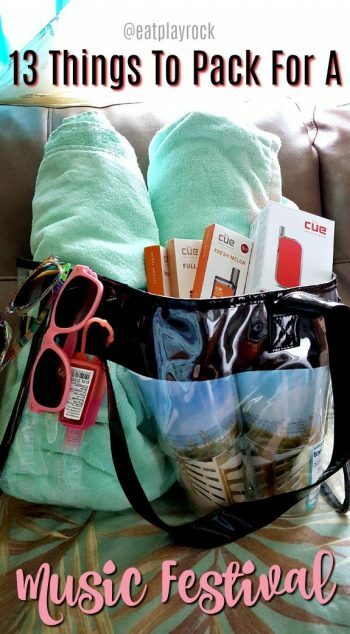 This is the perfect drink to have while you’re sitting by the beach during the summer! I love how refreshing it is! Yum! This looks great. I love the color. This um punch sounds yummy and refreshing that me and my husband would enjoy! I love the props you used in your photography too! This sounds like the perfect summer drink. I’ll have to stock up on Blue Chair Bay rum. This pirate rum punch looks absolutely refreshing!!!! This would make the perfect drink for the whole family this coming summer. Yum. That looks super refreshing. I love the color of it, looks really tasty and good! 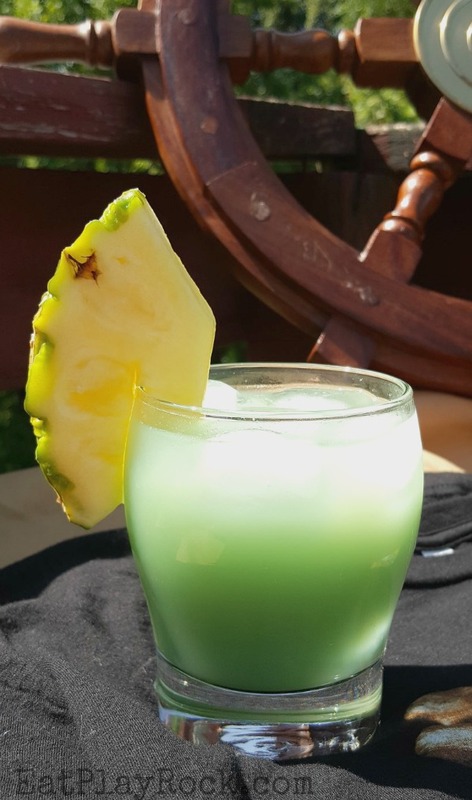 “Pirates of the Caribbean” this weekend for us The drink looks so yummy. It’s cool that you picked out Kenny Chesney songs to go with the Pirate Party – Thanks! I have had drinks with friends in a while and it would be so nice to just unwind and enjoy the summer heat. This drink recipe is perfect for those days. This sounds like such a yummy recipe! I would love to try this sometime! Looks like a great, refreshing drink to have even if all the hype about the Pirates of the Caribbean movie has died down. I am saving this recipe and maybe mix some this weekend. Looks so refreshing! I am saving the recipe. I don’t have to wait for another pirate inspired movie to serve this punch. We can have it every time we have a cookout! Wooooo, Rum sure has come a long way since I first consumed it (pleading the 5th with the exact when LOL). From a dark and heavy drink to these light and refreshing crowd pleasers ~ yum! Saving and making! This drink looks like just what i need this summer! 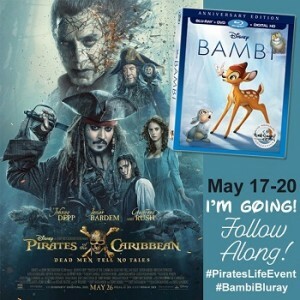 And i cant wait to see the new Pirates movie! I’m ready to get my rum on with that delicious looking rum punch. 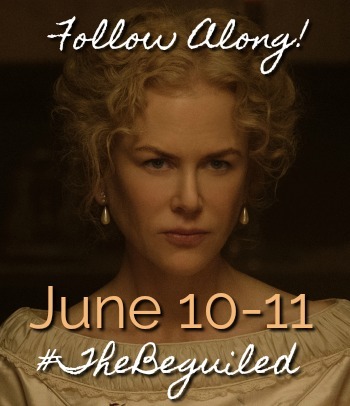 I’ll have to try your recipe while I wait to see this movie. I love the color!! It sounds like it’s delicious too! I love Blue Chair Rum! This looks like a fun summer drink! Ahoy, matey! Make a rum punch for this lady. I loved the movie, but now I’m waiting for the blu-ray so I can make myself a cocktail and watch it again. Coconut rum is my favorite, especially with pineapple juice! I’ve never heard of pineapple coconut juice before… I am going to look for that. Looks very refreshing! Haven’t tried rum recipes for quiet some time now but will definitely try again soon thanks to your article. Keep up the great work!